We love a novelty, so bored have we become chronicling the greedy deaths of untold pigs, cows, and chickens. Yes, yes, the occasional goat, deer, crab, or rabbit comes along to liven things up. And there was that lovely, deranged sea urchin from late 2008, but that's hardly sustaining. He is a standard-bearer for the next generation of suicidal "food" animals! All are welcome! Follow the kangaroo! Join him and seek your (imminent) destiny! Has your kind not been considered edible? Have you been scorned? Ridiculed? Have people expressed disgust when they think of eating you? These need not be impediments! Fly, strut, slink, slither, and crawl into the future and demand your place on top of the table! You will have the last—and very brief—laugh. You don't even need to be cooked. See? 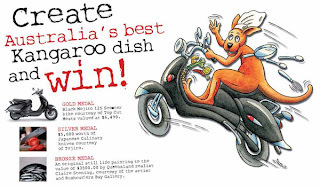 The kangaroo is tossing away kitchen implements as he goes! It is a message of death, of course. But of hope, too.